Seven months into his tenure, the early moves of the WHO’s first African chief are stoking a backlash. His supporters say Tedros Adhanom Ghebreyesus promised to shake the institution up. The critics, increasingly emboldened, say he’s undermining the World Health Organization’s effectiveness and putting its funding at risk. The former Ethiopian health minister turned heads with his appointment of Zimbabwean dictator Robert Mugabe as a goodwill ambassador in October. Meanwhile, behind the scenes, Tedros — as he prefers to be called by Ethiopian tradition — was eschewing the normal hiring process for U.N. agencies, looking to increase gender and geographical diversity as quickly as possible. That’s unsettled some in the Geneva headquarters and the constellation of activists and researchers who work with WHO, who fear an overly political approach is bringing a culture change at the cost of credibility. The latest disruptive move is his appointment of a little-known Russian official to run the WHO’s tuberculosis program, using a fast-track process, one month after meeting with President Vladimir Putin at a major gathering on the topic in Moscow. The Mugabe appointment “was stupid, but this is a disaster,” said Mark Harrington, executive director of Treatment Action Group. Ahead of the appointment, TAG led an open letter from more than 40 civil society groups asking Tedros to use a transparent, competitive process to choose the next director of the Global TB Program, tasked with fighting the top infectious killer worldwide. Russia is widely regarded as retrograde in its approach to treating the infectious disease, having developed a raging outbreak after the breakdown of the Soviet Union. Since 2000 or so, overall incidences are down and survival rates are up, but Russia is still a world leader on the proportion of infections that don’t respond to antibiotics; a recent study predicted one in three cases would be antibiotic resistant by 2040. Kasaeva replaces Mario Raviglione, a leading TB expert with more than 25 years of experience fighting the bacterial infection. Tedros says he’s just keeping a campaign promise to overhaul the agency in the wake of its high-profile failure to respond quickly to the 2014 Ebola crisis in West Africa. He is the first African to run the WHO — and the first director general chosen with a vote open to all member countries in May, overcoming what he called a “colonial mindset” among backers of his British rival. Tedros’ advisers have defended his decision to name Mugabe a goodwill ambassador for noncommunicable diseases less than four months into the job as just a misguided effort to build bridges with a regional giant who, despite human rights violations and a long embrace of the tobacco industry, recently expressed openness to new commitments on health. The offer was quickly retracted, but not before it triggered international condemnation. An opinion piece in the Washington Post even speculated that it was payback to Mugabe for securing the African Union’s support in the WHO election, or to China for its backing. Tedros’ first appointments have already transformed the gender and geographic balance within the top ranks, even as they have raised concerns about a closed selection that downplays conventional expertise. Of eight new directors chosen largely through a fast-track process, including Kasaeva, all but one are women. Tedros is trying change the recruitment system to eliminate “unconscious biases that make it unfavorable for women to get the positions,” a top Tedros adviser, Senait Fisseha, said in an email. Until that can be accomplished, she said, he had made “limited appointments of diverse and highly qualified women” to move his vision forward. That’s music to the ears of those who see an endless game of musical chairs that circulates people from one U.N. or international development agency to another. Often that means wealthy Western countries dictating to poorer countries how to deal with their problems in order to receive aid. Diversity is a worthy goal, said Global Coalition of TB Activists CEO Blessina Kumar. But it shouldn’t come “at the cost of effectiveness and competency. You can’t trade one for the other,” she said. Kasaeva’s appointment has proved politically volatile both for Russia’s speckled track record in combatting TB, and because it’s seen as playing into Putin’s hands, helping the Russian president project power on the global health stage while he neglects patients back home. In 2012, Russia rejected a $127 million grant from the Global Fund to Fight AIDS, Tuberculosis and Malaria, stifling many of the groups on the ground. On top of that, the federal government cut domestic TB funding in recent years, according to Gómez. Putin addressed the gathering and met with Tedros. A month later, on December 15, Tedros announced Kasaeva’s appointment in an internal WHO email. “I can’t see what the upside is other than political payback,” Harrington said. Defenders say Russia’s TB program is improving — driven in part by Kasaeva — and that she may be the best hope for getting the country to change. Vadim Testov, a former WHO official now working on Russia’s TB program, said he’s seen the government’s commitment increase over time, and that it’s “ready to provide” financing to make Russia’s domestic TB fight successful. He noted that new regulations from Kasaeva’s team have led to a sharper decrease in TB cases over the last five years. Kasaeva “will have influence on Russian officials” in her WHO position, Testov predicted. Many aren’t sold on Tedros’ new approach and fear that global health will suffer — especially if the WHO’s biggest donors get spooked. 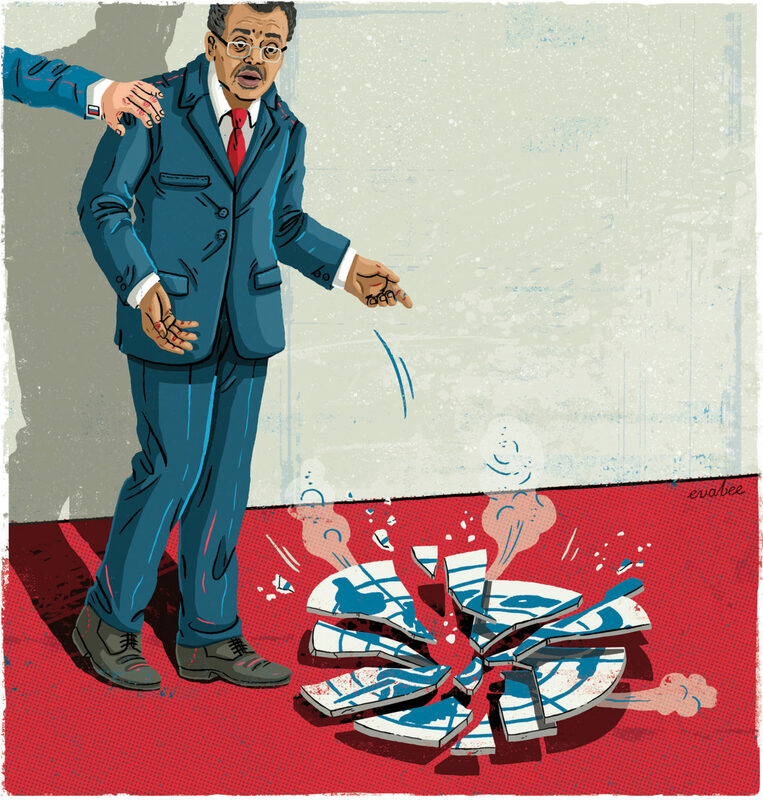 The backlash shows the risks from Tedros’ effort to upend the status quo. Defenders say the same-old same-old at the U.N. hasn’t served patients on Ebola, TB or a range of other issues. “Whatever we’ve been doing for the last quarter century isn’t working that well,” said Salmaan Keshavjee, a Harvard TB expert who has worked on the ground in Russia with Partners in Health. He argued that WHO recommendations have in the past been ill-suited to Russia’s circumstances and that homegrown experts from emerging, populous economies may be in a better position to solve their own problems and bring a new perspective to the global effort. “If you want to hold the BRICS countries’ feet to the fire, they have to be involved in health architecture,” Keshavjee said. But many aren’t sold on Tedros’ new approach and fear that global health will suffer — especially if the WHO’s biggest donors get spooked. Though ultimately blocked, U.S. President Donald Trump’s proposal to cut back on foreign aid — announced on May 23, the same day Tedros was elected to lead the WHO — has alarmed many in the organization. The recent controversies drive some worry that other large donors like the U.K. or Germany might be tempted to draw the purse strings tighter. The U.S. contributes almost a quarter of the WHO’s $4 billion-plus annual budget. Tedros’ doctorate is in community health, and he served as Ethiopia’s health minister for seven years — winning wide praise for strides in expanding contraception, fighting malaria and, yes, controlling TB. But it may be his experience as Ethiopia’s top diplomat from 2012 to 2016 that seems most apposite now. During that period, he kept his country in the West’s good graces (and the aid money flowing) despite growing concerns about the regime’s human rights violations, by stressing Ethiopia’s position as a stable, strategic partner in the war on terror. Tedros’ team includes plenty of conventional choices; Jane Ellison, a Brit, served as something of an olive branch to the WHO’s No. 2 state donor after the U.K. strongly backed its own candidate in a campaign that turned nasty. Tedros also named a German to a long-sought top post after Berlin stepped up donations and raised Tedros’ profile by inviting him to the G20 summit. Poor Teddy, he really is lost! ← ከሕወሃት ክህደት ባሻገር፣ የሕወሃት ወይስ የትግራይ የበላይነት፣ወይንስ የትግሬዎችም በጣምራ ለሶስት ሃገራችንን የተቆጣጠሩት?